Whatever features you need in a chair, we’ve got them with our great range of straight stairlifts. 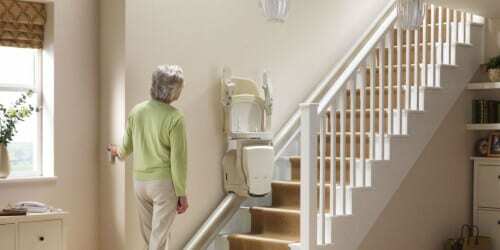 If you find getting up and down stairs a chore and your stairs have no corners or internal landings, a straight stairlift is the answer. All of them include seatbelts and safety cut-outs which detect objects on the stairs to ensure your wellbeing. Some stairliftscan even be installed outdoors. All of the straight stairlifts supplied by Domestic Lift Services Ltd conform to British manufacturing and safety standards. With many years of local experience we have a team of specialists who provide exceptional knowledge and support. We have been established since 2001 and our trained stairlift team can help you recommend a suitable stairlift for your requirements. With a conveniently showroom with ground level parking facilities we are certain that we can help to keep you mobile. What are the main benefits of a straight stairlft? For more information or to talk to an advisor please call 01494 471430 or request a free no obligation site survey.